Each year, many manatees are killed or injured by watercraft collisions. They also accidentally ingest fishhooks, litter, or they can become entangled in crab trap or monofilament line. But people may be able to help rescue a manatee by calling wildlife officials. They will investigate and, if need be, coordinate the rescue of the manatee. If you spot a sick, injured, or orphaned manatee, or a manatee being harassed, you should immediately report it. Please also report dead manatees or a manatee wearing a “tag” or tracking device. Call 1-888-404-FWCC (3922). You can also send a text message or email to Tip@MyFWC.com or use VHF Channel 16 on your marine radio. You can also download the free FWC Reporter app on your smartphone or tablet. Click the following link to get information on how to report manatees to your local wildlife officials. Call Dauphin Island Sea Lab’s Manatee Sighting Network at 1-866-493-5803. Call the Louisiana Department of Wildlife and Fisheries at 1-800-442-2511. Call the Texas Marine Mammal Stranding Network at 1-800-9-MAMMAL (800-962-6625). Please give dispatchers the exact location of the manatee. If you see a manatee with a pink or red wound or with deep cuts. This means the wound is fresh. If you see a manatee with grayish-white or white wounds, this likely means the wound has healed. But the manatee can still have internal injuries, so continue to observe the animal for any of the other characteristics listed here. If the manatee is tilting to one side, unable to submerge, seems to have trouble breathing, or is acting strangely. If you observe a manatee calf by itself with no adults around for an extended period of time. Manatee calves may remain dependent on their mothers for up to two years. If the mother dies before the calf is weaned, there is a strong likelihood the calf will not survive alone. If you see anyone harassing a manatee. If you see a manatee who has become entangled in monofilament line, crabtrap lines, or other debris. Do not attempt to remove debris by yourself. Debris may be embedded underneath the skin and only a trained veterinarian can adequately assess and repair the damage. If you see a dead manatee. By doing a necropsy, scientists can sometimes determine the cause of death and better understand the dangers to manatees. If you see a manatee tagged with a radio or satellite transmitter. Sightings of tagged manatees help provide researchers with information that can be used to protect manatees and their habitat. However, do not attempt to remove the transmitter. It is designed to come off if it becomes entangled, so the animal won’t be trapped. Manatees Ace and Venice await release back into their natural environment near Fort Myers, Florida. Ace had been been rescued for cold stress and was rehabilitated at the South Florida Museum in Bradenton, and Venice was rehabilitated at ZooTampa at Lowry Park. Florida Fish and Wildlife Conservation Commission (FWC) biologists work with a network of agencies and organizations to rescue manatees and transport them to rehabilitation facilities. SeaWorld Orlando, Ellie Schiller Homosassa Springs Wildlife State Park, ZooTampa at Lowry Park, Miami Seaquarium, Dolphin Research Center, and the Manatee Critical Care Center at the Jacksonville Zoo are all facilities in Florida that are authorized under the joint supervision of the U.S. 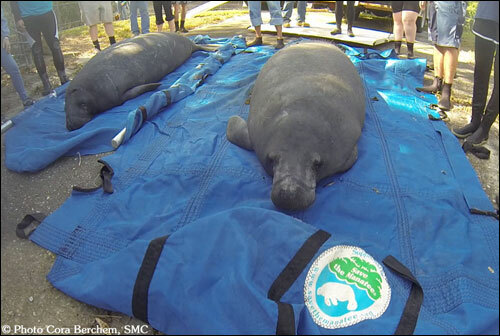 Fish and Wildlife Service and the FWC to capture, transport and/or treat manatees. In addition, a number of agencies and organizations exist outside of Florida to help manatees, including Dauphin Island Sea Lab’s Manatee Sighting Network, the Louisiana Department of Wildlife and Fisheries, and the Texas Marine Mammal Stranding Network, among others. 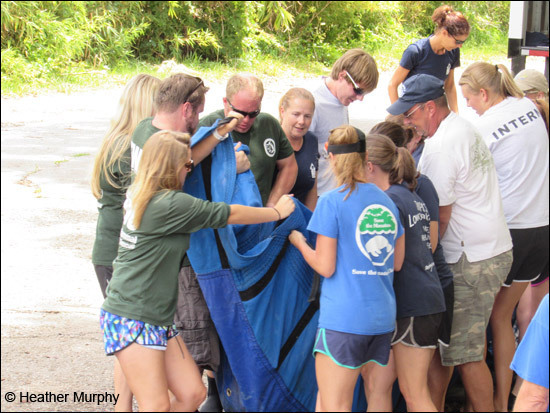 Save the Manatee Club staff handle reports from the public on injured manatees and help to facilitate rescues. SMC has also provided funds for equipment used in manatee rescue and rehabilitation efforts both in and outside of Florida. Leesburg the manatee is released at Welaka, Florida, in May 2016 after undergoing rehabilitation for severe cold stress at ZooTampa at Lowry Park. Supporting manatee rescue and rehabilitation has been a fundamental aspect of Save the Manatee Club (SMC) for decades. SMC has provided funding and staff assistance for multiple manatee rescues and releases, as well as funds for the care and rehabilitation of injured and cold-stressed manatees at a number of facilities. SMC provided funds to the Ellie Schiller Homosassa Springs Wildlife State Park (HSWSP) in order to feed and care for manatees rescued due to red tide exposure. In previous years, SMC has funded heat, veterinary care, and food for manatees recovering from cold stress at HSWSP. 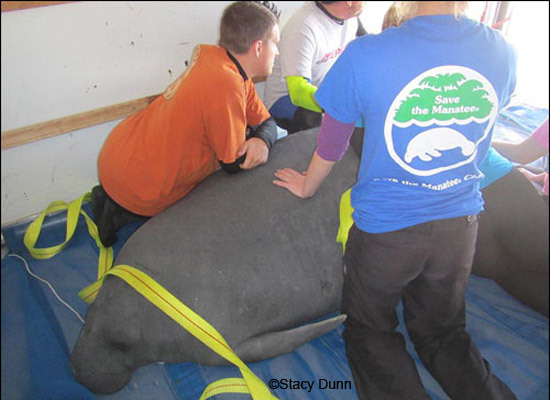 In addition, SMC has provided necessary equipment, such as a manatee stretcher and a centrifuge, to HSWSP. Rescue and rehabilitation efforts have also included assisting ZooTampa at Lowry Park with their manatee rehabilitation efforts by raising funds for a variety of essential equipment, including a new crane scale, shade cloths for medical pools, a new stretcher, and critical care pool doors. SMC has also provided funds for a new net for the Marine Mammal Stranding Center in New Jersey in order to assist with manatee rescue in the northeast region, supported a tracking program in the Florida Keys focused on rehabilitated manatees with a history of monofilament entanglements, and started a manatee adoption program with the Dauphin Island Sea Lab’s Manatee Sighting Network in order to provide additional funds for the manatee stranding program. Manatee “Longo” waiting to be released at the TECO power plant in Apollo Beach after being rehabilitated for cold stress syndrome at ZooTampa at Lowry Park and South Florida Museum. SMC has actively supported manatee rehabilitation as a member of the Manatee Rescue and Rehabilitation Partnership (MRP). Executive Director Patrick Rose and Dr. Katie Tripp, Director of Science and Conservation, have led various subcommittees of the MRP and Dr. Tripp has co-chaired the Partnership. Through the years, SMC has consistently contributed to, and led advocacy efforts, to ensure the essential preservation of much of the state’s funding for the Florida Manatee Critical Care Program, which financially supports the rescue, rehabilitation, release, and monitoring of cold-stressed and injured manatees. These funds have treated hundreds of manatees that may have suffered and died without proper treatment. SMC supports rescue, rehabilitation, research, and relocation of manatees around the world, located in areas such as Belize, the Bahamas, Jamaica, West Africa, Senegal, Brazil, and the United States. Collaboration with Wildtracks rehabilitation facility in Belize has involved contributing funds for food, medicine, and infrastructure updates of the facility, including a new lift system and a new pump for a water heating system. SMC has also provided over 600 pounds of much-needed formula to feed orphaned manatees in Belize, as well as funds for upgrades to the food prep kitchen at Wildtracks to provide food for manatees in rehabilitation. SMC has also supported orphaned manatees, such as Twiggy in Belize and Victor in West Africa, with food and medicine. Download 2017 Manatee Mortality Statistics, a sheet with statistics from 2017 and information on how to report an injured manatee (pdf). Learn how you can help SMC do even more to help sick and injured manatees. Read more about the Manatee Rescue Program and see more photos of manatee rescues at the Florida Fish and Wildlife Conservation Commission’s web site. Visit the Manatee Rehabilitation Partnership web site.